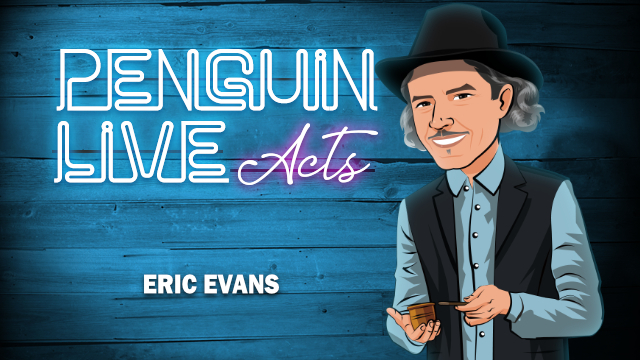 Today, when you order "Eric Evans LIVE ACT", you'll instantly be emailed a Penguin Magic gift certificate. You can spend it on anything you like at Penguin, just like cash. Just complete your order as normal, and within seconds you'll get an email with your gift certificate. Eric Evans LIVE ACT (Penguin LIVE) SUPPORT LIVE MAGIC. START LEARNING THE FULL ACT TODAY. Aaron’s Wand- A magic stick disappears and reappears from a coin purse. QuickSilver Dollar- A single coin “flurry” that ends with a production of countless jumbo coins. Cut and Restored Rope- A classic that may fool the best all the same. Mad Hatter- A novel card divination. Tips- Beyond teaching theses solid and effective routines, Eric also shares invaluable advice on gathering a crowd, how to interact with the audience for maximum impact, and how to ensure the biggest tip after your performances. Eric Evans comes to us from Austin, Texas. Over a career that has spanned almost three decades, he has toured all over the world performing on streets and in theaters. 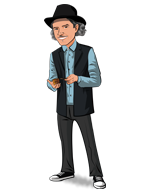 He is a student of two gifted and kind teachers, both internationally recognized for their outstanding contributions to magic: Ernest Earick (who’s work was featured in Steven Minch’s book, “By Forces Unseen”) and Jim Cellini (Internationally acclaimed “King of the Street” and author of “The Royal Touch”). Eric’s manipulations have been compared to the likes of Fred Kaps, Cardini, and T Nelson Downs. He wrote the book “The Secret Art of Magic” along with Nowlin Craver, and is an award-winning magician who has also been twice nominated for Parlor Magician of the Year at the Magic Castle. Purchase this product and on March 24th anytime after 12:00pm Eastern, click the MyPenguinMagic area at the top of the Penguin site. You'll see the "learn" button appear next to this lecture. One of the finest street magicians and a student of Cellini. 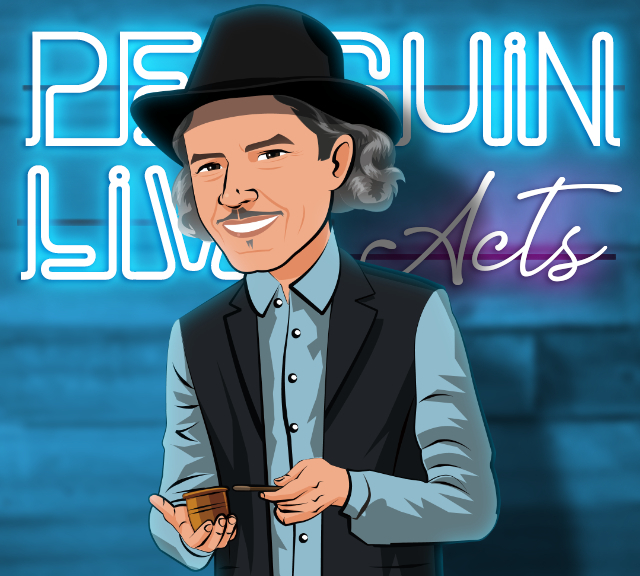 This download is gold for any magician even if he never intends to busk in the street! First, let me state that I am not trying to demean this man's work. But this simply is not worth $40. Eric Evans is a street performer with a good, stable, dependable act for laymen. Admittedly, Mr. Evans has made some adjustments to tricks or routines to fit his personality and/or performing circumstances. But these changes are not worth the purchase price, and are the type of changes anyone would make. In other words, his personalized nuances are not creative enough to note. If you are new to magic and haven't seen many magicians perform, this might be worth checking out. Otherwise, save your money. Again, while Mr. Evans is almost certainly appreciated by the laymen on the streets where he performs, I simply do not think his act warrants the asking price on this video, or careful study. He is certainly experienced and has things to teach, and has developed a point of view. I am not discounting that. But I was disappointed with this purchase. Eric Evans imparts wisdom for those wanting to learn drawing a crowd, keeping their interest, interacting with them, and hatting them. The props are simple and can easily be managed in a bag, pouch, or out of your pockets. With the exception of one gimmick, which you likely have, everything could be purchased at a general store. Thankfully Dan was there to ask questions of Eric during tutorials. Dan's questions drew out the nuances and touches to the effects. I like the live act format because I think there is huge benefit from seeing a show and then learning the magician's thought from their routining. You will definitely get something out of this if you plan on performing on the street or a venue where people were not originally planning on watching you. If that's not going to be you, then you may not get as much out of this. I've been making my living doing street magic for just over a year now, and this lecture is an eye opening experience on how to get out from behind the table, with a Truly portable, and practical show. Eric is a student of Cellini so if you're familiar with Cellini you will definitely see (and hear) Cellini reincarnated with some new ideas along the way. His ideas have already helped me to make more money on the street, by turning my close up sidewalk style show (bulky table/dolly etc) and stream line it into a stand up style show that plays to audiences big or small. Brilliant! I don't like to do a lot of card tricks, but Eric gives away two really good card tricks. The card from the hat, and rock from the shoe I started performing the next night and are getting great responses! I'm excited about the upcoming release of his balls from mouth. And I like his therory on the trick. Dan Harlen did a great job making sure everything got covered, his new haircut kept making me think he was Scott Alexander for some reason, haha. I preordered so I saved, but the information in here is worth gold to someone who makes thier living busking as a magician. Mahalo Eric! Street magicians perform hundreds of shows over and over again to the point of incredible polish. And it shows. Damn he's good! Not only is the sleight of hand amazing the audience interaction and patter is just a joy to watch. Eric's the best. This Live Act is packed with information and value. Solid magic that works in the toughest of environments-the streets.